Ripe bananas sitting on the counter means it is time to bake. Often times I make banana bread which is perfect in the mornings with yogurt and fresh fruit. But when I want a delicious and quick weekday dessert, this Chocolate Banana Cake is what I turn to. This recipe is one I adapted from Canadian Jane Rodmell's Best Summer Weekends Cookbook. It combines the sweetness of ripe mashed bananas with cocoa powder. Wonderful plain, but even better when frosted with a smooth and creamy Chocolate Ganache. This would also be the perfect snacking cake for family gatherings as it feeds up to 16 people. Chocolate Banana Cake is a snap to put together. Fifteen minutes is about all you need. It is more like a quick bread in that you do not use a mixer, just two bowls. One for the dry ingredients and one for the wet ingredients. The two are then mixed together and you are done. The fat is in liquid form, which gives the cake a wonderful moist texture and tender crumb that keeps the cake soft even when refrigerated. As far as the type of oil to use in this cake, you can use canola, safflower, vegetable, or corn. As I said above, the frosting is a Chocolate Ganache, which is a French term referring to a rich and smooth mixture of chopped semi sweet or bittersweet chocolate and heavy cream. While it is often poured over a cake or torte for a smooth and shiny glaze, this time it is whipped so it becomes a thick and spreadable frosting. 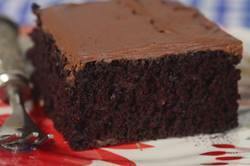 Chocolate Banana Cake: Preheat your oven to 350 degrees F (180 degrees C) and place rack in the center of the oven. Butter, or spray with a non stick vegetable spray, a 9 x 13 inch (23 x 33 cm) pan. Line the bottom of the pan with parchment paper. In a large bowl, whisk together the flour, cocoa powder, baking powder, baking soda, salt, and sugar. In another large bowl, whisk the eggs. Then stir in the mashed bananas, water (or coffee), milk, oil, and vanilla extract. Add the wet ingredients to the dry ingredients and stir, or whisk, until combined. (The batter is quite thin.) Pour the batter into the prepared pan and bake for about 35 to 40 minutes or until a toothpick inserted into the center of the cake comes out clean. Ganache: Place the chopped chocolate in a medium sized stainless steel, or heatproof bowl. Set aside. Heat the cream and butter in a medium sized saucepan over medium heat (can also be heated in the microwave). Bring just to a boil. Immediately pour the boiling cream over the chocolate and allow to stand for a few minutes. Stir until smooth, then let stand at room temperature until the Ganache has completely cooled (can also place in the refrigerator). Then with a hand mixer or wire whisk beat until soft and fluffy. Spread the Ganache on the top of the cake. Serves about 14 - 16 people.